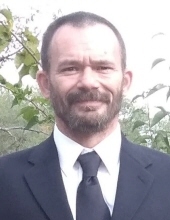 Celebrating the life of Earl Burnett Jr.
Obituary for Earl Burnett Jr.
Earl L. Burnett Jr., 44, of Peoria passed away Sunday, March 24, 2019 at OSF St. Francis Medical Center in Peoria. He was born February 4, 1975 in Peoria to Earl L. and Rosemary Dobbs Burnett Sr. He married January G. Stein October 13, 2016 in Peoria; she survives. He is also survived by his mother, Rosemary Burnett; children, Earl L. Burnett III, Christal (Jesse) Ropp, Ira Burnett, Emma Burnett, Serenity Burnett; grandchildren, Jesse and Cooper Ropp; siblings, April (Dave) Hartwell, Christina (Robert) Walsh, Debra (Daniel) Conrad and many nieces and nephews. His father and sister, Rose Burnett preceded him in death. Earl would have helped anyone who needed help. He enjoyed fishing and mushroom hunting. He especially enjoyed life and his family. Cremation has been accorded and no services will be held. To send flowers or a remembrance gift to the family of Earl Burnett Jr., please visit our Tribute Store. "Email Address" would like to share the life celebration of Earl Burnett Jr.. Click on the "link" to go to share a favorite memory or leave a condolence message for the family.